Obituary for Deborah T. (Truitt) Weber | Thomas Funeral Home P.A. 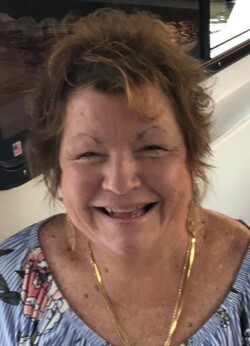 Deborah T. Weber, 62, of Cambridge passed away on Sunday, January 27, 2019 at UMSMC at Dorchester. She was born in Cambridge on April 17, 1956 and was a daughter of the late Paul Medford Truitt and Alma Thomas Truitt. Mrs. Weber graduated from Cambridge High School class of 1974. She continued on to Delmarva Beauty Academy in Salisbury. On September 14, 1975, she married Elmer Weber. Mrs. Weber had worked at Hairport, Shear Sensations, and Europa. At the time of her passing, she was with Twins and Co. She enjoyed cooking, gardening, shopping, soft crabbing and decorating for Christmas. She was a member of Neck District Volunteer Fire Company, and Spedden United Methodist Church. She is survived by her husband Elmer Weber of Cambridge, two sons Chris Weber and wife Amy of Cambridge, and Clay Weber of Cambridge, three grandchildren Gavin, Kinsley and Karolina Weber all of Cambridge, two cousins Milton Jerome "Joe Boy" Truitt, Jr. of Cambridge and Judy Rippons of Delaware, two godsons Joshua Wheeler and Matthew Wheeler and several nieces, nephews and other cousins. Pallbearers will be Joshua Wheeler, Matthew Wheeler, Edward L. Howard, Greg Howard, Robert Howard and David Marshall. Honorary pallbearers will be Keith Howard and Joe Truitt. A funeral service will be held on Saturday, February 2, 2019 at 12 pm at Thomas Funeral Home, P.A. in Cambridge with Rev. David Kreek officiating. Interment will follow at Spedden Seward Cemetery. Family will receive friends from 10 to 12. Memorial contributions can be made to Spedden United Methodist Church, c/o Carolyn Wright, 507 Gay St., Cambridge, MD 21613.